LG 55EG960V review | What Hi-Fi? The LG 55EG960V is the first 4K OLED screen we’ve tested, and it’s everything we hoped it would be. It delivers the combination we’ve been waiting for – 4K Ultra HD resolution and OLED technology – and it does so with spectacular results. An OLED panel consists of pixels made up of organic carbon-based film, which light up when a current is put through them. Unlike LCD screens that need a backlight, OLED pixels are self-lighting. So when a pixel turns off, it’s pitch black. There’s no residual light bleeding into dark areas as with backlit LCDs, meaning we can have proper, inky blacks while retaining brightness, punch and clarity – the holy grail of TV technology. LG takes its OLED technology further by adding a fourth white pixel alongside the standard RGB (red, green and blue) model for more accurate colours. So does it work? Oh, absolutely. The LG 55EG960V delivers on every promise, from intensely dark black scenes to bright and punchy whites. There are almost 8.3 million pixels on this 4K Ultra HD screen, and each looks crystal clear, punchy and precise. We stream House of Cards in 4K via Netflix, and are blown away by the detail on display. The depth of colours is breathtaking. They aren’t just richer, there are simply more precise shades of them on the screen, giving a wonderfully vivid feel to the picture. The interplay of light and shadow on trees, buildings and on people’s faces is fascinating. Unlike early OLED sets, where the strong contrast meant nuances in detail were swallowed up, this set expertly delivers the fine textures of a black suit and the myriad colours within a sun flare. Motion handling is stable, although we turn to the de-judder and de-blur settings to smooth out the picture more. Those characteristics remain when watching HD channels and Blu-ray films. We play our test favourite Star Trek Blu-ray and the spaceships look convincing. The steely structure of the USS Enterprise looks spectacular against the pitch-black backdrop of space, and while most of the giant Romulan mining ship is engulfed in shadow, you’re still aware of its hulking great mass. A quick comparison with the 4K Samsung UE55HU7500 shows how relatively grey those same scenes look on an LCD screen. You don’t have to watch sci-fi films to appreciate OLED – much as we love them. Play a more natural-toned film such as The Imitation Game, and the LG screen is just as captivating to watch. Skin tones look natural and fleshed out, while the texture of clothes and furniture are so detailed and rich they look tactile. If you’ve ever had doubts about 3D films, watch Gravity on this LG telly. The passive technology means the 3D effect is gentle on your eyes, but the depth offered by OLED is utterly immersive. The advantages of OLED kick in when you see just how dizzyingly vast and deep the void-like blackness of space looks, while the millions of stars are piercingly bright. You get four lightweight glasses in the box, and we’d urge you to give 3D a go. But what about standard definition? Let’s face it, despite the increase in 4K content and Full HD being the norm, there’s still an awful lot of non-HD channels and DVDs around. While it’s a shame to watch ropey old standard def on such a talented 4K screen, the LG TV works hard to upscale Who Framed Roger Rabbit? on DVD. There are the expected fuzzy edges and drop in absolute detail, but the picture is still bright and punchy. We do find, though, that our Award-winning Samsung 4K TV (the UE55HU7500) is a touch crisper when it comes to upscaling. We’ve been griping about poor sound quality from slim TVs for years now, and LG has teamed up with Harman Kardon to outfit its 2015 screens with better sound. The 55EG960V has two down-firing speakers at the base of the screen, and they sound smooth and weighty. Voices are clear and expressive, with enough detail to hold your attention. We wish it sounded more open and dynamic, though, as it can sound overly damped even at higher volumes. Switching from Standard to Cinema sound mode breathes more space and scale into the sound without losing that solid detail. Still, to accompany such a fine screen, you should have a dedicated 5.1 speaker package to get the full cinematic impact. For £3800, you’ll want something rather special and the TV itself looks beautiful. The gentle swoop of the curved screen, the wafer-thin panel and that gorgeous floating screen effect – it’s an elegant design that looks effortlessly expensive. The screen is only slightly curved, but you still get a slight distortion if you’re sitting off-axis from the centre. Curved LCD screens have so far also given us washed-out colours when viewed from an angle, but here’s OLED’s party trick: the contrast stays just as strong, the blacks just as deep and whites as bright and punchy as ever even when viewed from extreme angles. There is, incredibly, no fading whatsoever. A glance at the back panel shows that the screen isn’t super thin all the way, giving scope for connectivity, internal speakers, and the ability to wall-mount the TV. Connections include three HDMI inputs (two of which can handle 4K/60p), three USB ports, an optical output and legacy analogue connections. You can access the internet using wired ethernet or wi-fi, and we experience no dropouts in streaming 4K. LG has yet another ace up its sleeve: WebOS 2.0. We were pretty effusive in our appreciation of LG’s smart interface last year, and the company claims the updated version is 60 per cent faster. The animations are fluid, apps launch almost instantly, and the Launcher (the row of cards at the bottom the screen that show your most recently opened apps) is intuitive to use. LG’s updated remote finally gives the Magic Remote a proper keypad, so you don’t have to faff about with two remotes. That remote has shortcut buttons, a scrolling wheel, and a gyroscope to control the on screen cursor. It’s responsive, but we can’t imagine everyone will warm to the cursor on a daily basis. Other updates include clever shortcuts to settings and inputs that don’t take up too much of the screen, as well as a ‘My Channels’ section in the Launcher where you can store your favourite channels for easy access. The idea is that you can launch BBC One HD or Sky Atlantic HD as instantly as the Netflix or BBC iPlayer shortcuts. Amazon Instant Video, Demand 5, YouTube and Wuaki.tv offer further on demand video content. There’s scope for personalised recommendations based on what you’re watching, but we will need a longer testing period to see how effective the feature is. So far, the TV knows we like watching a lot of BBC HD. It’s fair to say we’re impressed with the LG 55EG960V, but it’s not without reservations. Price is an issue. £3800 is a hefty amount of money for a 55in screen, but it’s worth remembering that you’re paying the premium for the new OLED technology and that elegant set design. However, much like the first Full HD and 4K screens, we expect the price to come down once OLED is more widespread. We can’t say for sure if this is the best TV we’ll see this year. Nor can we (yet) make a judgement on whether OLED is better than LCD/LED given the significant price differential between them and the fact that we haven't seen a sufficient number of new OLED sets to compare directly with similarly-sized LCD/LED ones. 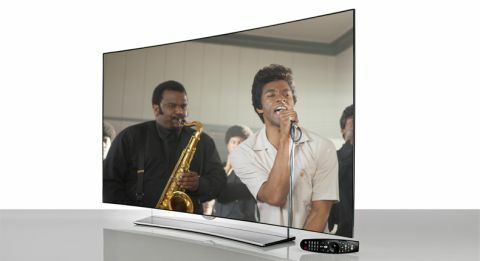 But if this gorgeous LG 55EG960V is anything to go by, the future of TV looks spectacular.